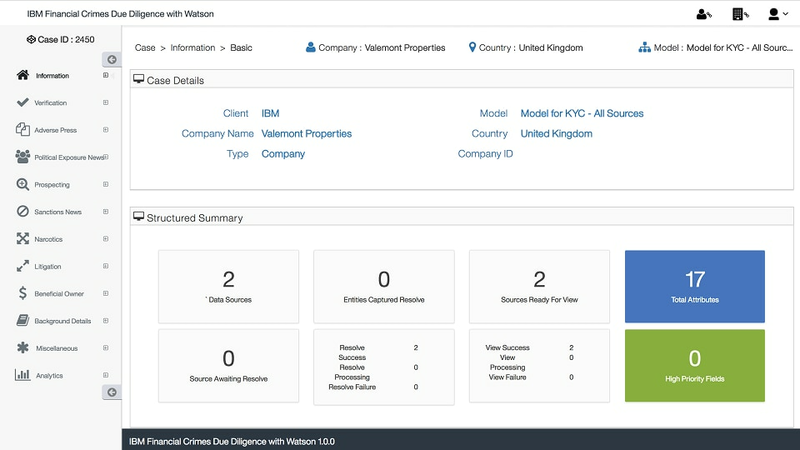 IBM® Financial Crimes Due Diligence with Watson® streamlines due diligence processes, enabling financial institutions to improve the customer experience while the increasing accuracy of results. Due Diligence reduces the time required to gather information by pre-populating customer details and automating much of the screening process. The solution uses cognitive accelerators to uncover previously unknown risks in business relationships, delivering a comprehensive and effective approach to Know Your Customer (KYC) compliance – all powered by Watson. Increases the speed of the client verification process through the aggregation of structured and unstructured data from multiple 3rd parties. Enhances the accuracy and efficiency of reviews through cognitive analysis of transactional, internal and external data. Enhances and accelerates the customer due diligence processes and ongoing screening requirements using Watson-powered cognitive robotic process automation.